First time seeing this series? You're missing out! Read the first part of ETech 7's Starting Up Your StartUp Series here: [Part I] Starting Up Your StartUp Series: A Guide for Companies With 1-10 Employees or read the recap below! Now that we have given you tips on what types of hardware to buy for your small business as well as established why people are actually more productive in the office rather than at home, let's dive right into the meatier parts of the subject. Why IT - specifically the Internet and protecting your data - is essential to your startup business. According to Lifewire, an ISP is a company you pay a fee to in order to access the Internet. No matter what kind of internet access (cable, DSL, dial-up), an ISP provides you or your business a larger pipe to the Internet. Was that a lot to process? Okay, here's a simpler explanation: ISPs are companies that provide YOU or YOUR BUSINESS access to the Internet. The world today revolves around the Internet, and that means your business needs to as well. Therefore, you need an Internet service provider. Most Internet service providers will give you a modem to start with, which is enough if you are only looking to hook one device up to the Internet. This device must have an Ethernet port as well because a modem is only the device that gives you Internet as it converts analog waves into digital ones that your computer uses. 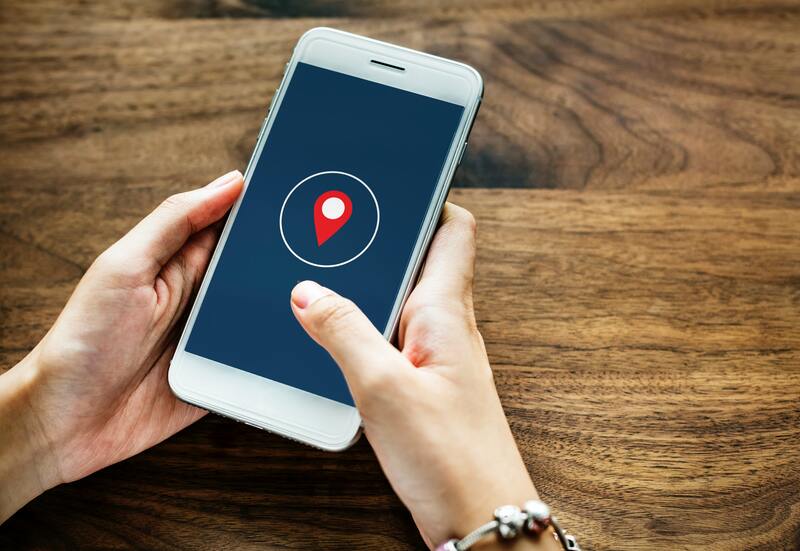 A lot may disagree but location might just be the most important factor when it comes to finding the perfect ISP for your business. If you have decided that your new office would be in a metro area then you're in luck. Chances are, all the major internet service providers are going to be able to provide you with a reliable service mainly because of the high demand in your area. Here's the tricky part... If you're trying to set up your business in a rural area, then you might have a problem getting a high-speed connection. ETech's tips? List Internet providers in your area and then look for reviews online to gauge whether or not an ISP performs well in your area. However, look at it this way, when you have 5-10 employees using the same Internet connection at the same time - it really is a no-brainer. 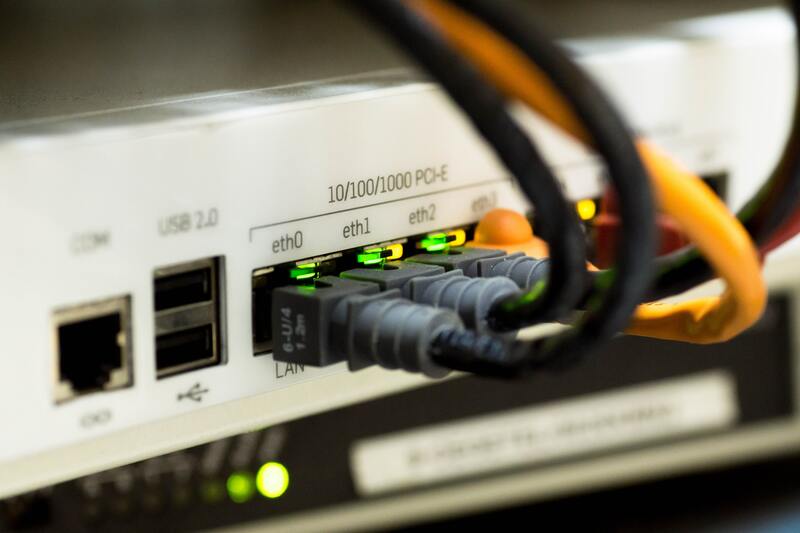 Having a fast Internet connection means your business will be running more smoothly and YOU will have peace of mind knowing that clients will be attended to in a timely manner. Ahh here's the taboo word... COST. Businesses sometimes compromise speed for cost and in reality, it just doesn't make sense for a business in the long run. Let's say you sign up for ISP A on the premise that they will be much cheaper than other more reliable options. You sign-up, pay your setup fee, and pay your modem fee. And now you're good to go! After a few months, you experience intermittent connection, slow speeds, and LOADS of downtime. Now you're thinking... "I should switch to a much more reliable connection." When you switch to ISP B however, you pay the setup fee, the sign-up fee, and the modem fee AGAIN... And then you come into the realization that you wasted money not only on subpar services but also paying for sign-ups, setups, and modems TWICE! In addition, since you only stayed for ISP A for a few months, you would have to buy out of your contract. That's just a big no-no. As mentioned in the Speed section, think of this as an investment. It can be argued that cost may be relative but then we go back to you - as a small business owner - knowing your business more than anyone else and knowing what it actually needs. Think twice before jumping in! ETech 7 wrote an extensive piece on the Cloud and Cloud Computing back in 2018. ETech 7 CEO Emil Isanov also put it perfectly in saying that "Cloud computing is a term used for the delivery of hosted services over the Internet. In layman's terms, cloud computing enables its users to access and use a network of remote servers in order to store, manage, and process data as opposed to buying, maintaining, and paying for a local server." In other words, the cloud is sort of an internet facility that anyone from anywhere can access anytime as long as you have a stable internet connection. Why is the internet the common denominator in all this you ask? Well, imagine the internet as this big big big building that hosts almost a million tenants. As a visitor of the said building, you wouldn’t be able to search all one million names to find the person you are looking for, correct? Therefore, you need a building guide/address guide to find said person. The building is the internet and the building guide/address guide is cloud computing. For a more technical definition, Microsoft defines cloud/cloud computing as the delivery of computing services - servers, storages, databases, networking, software, analytics, and more - over the Internet. Still curious? Check out our post entitled "Everything You Need To Know About Cloud Computing." Get it? Back to regular... programming. You must have scratched your head when you read "Backup and Disaster Recovery" as an advantage of using the Cloud. And yes, that's a perfectly normal reaction. Now, what is it, really? Prevention is better than cure. Much like you, your business needs to be in tip-top shape in order to be ready for any unforeseen circumstances that may disrupt your day-to-day business operations and functions. Regardless of industry, business continuity is an undeniable necessity, especially in today’s fast-paced world. From data security breaches to damage to infrastructure, are you confident that your business is well-equipped to deal with a little bit of downtime? If you answered no, read on. If you answered yes, think again. In a world where data is king, it’s important for businesses to protect their data 24/7/365. Fortunately, for your small business, there's Backup and Disaster Recovery Planning. Disaster recovery is simply a plan that allows a company to access their data in the event of a disaster that might destroy a part or all of your business’ resources. Think of it as insurance that you don’t usually use but you most definitely need. 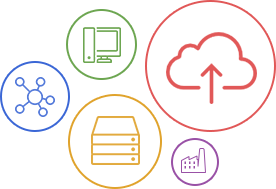 The main function of a disaster recovery plan is to quickly restore your systems, mitigate risk, minimize downtime, speed-up recovery, and secure and protect sensitive data. Regardless of business size, your business could not afford even an hour of downtime. Whether you’re a business, a public organization, or a charity, you need to know how you can keep going under any circumstances. Disaster recovery plans help your company identify potential threats, develop initial responses, and implement a measurable contingency plan that is tailored to the needs of your company. 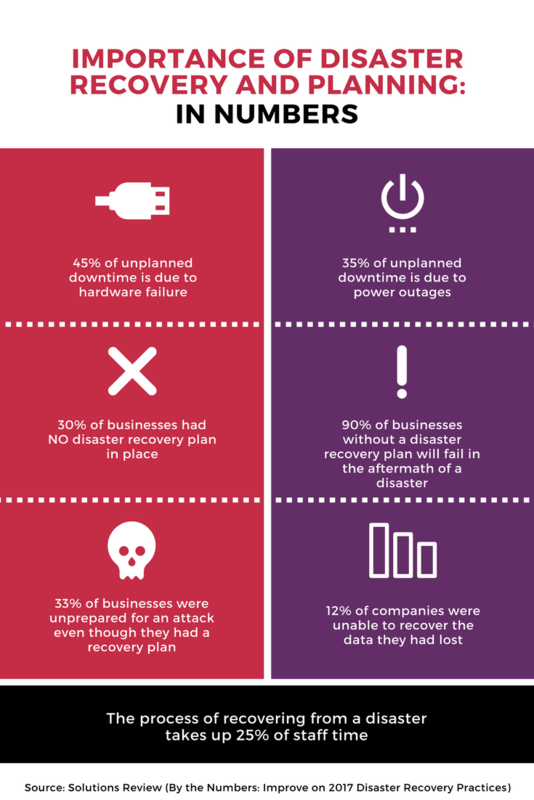 If you want to know more, click the infographic to visit ETech 7's extensive blog post about why businesses need disaster recovery plans. Now we know these are a lot to take in... But boy have we got a treat for you! In the third part of our Starting Up Your StartUp Series, we will discuss how you can SKIP - yes, you heard that right - all this! Stay tuned!